Fits Fitbit Ionic watch perfectly with easy installation. Soft and durable TPU creates bulk-free to your watch. 360 degree protection to your watch, includes watch face and sides, against bumps and scrapes. Touch sensibility remains with bumper case wearing on, fast responsiveness release when operating. Double electroplating on the bare case make the color more hard-wearing and glaring through a long time wearing. Please remove your upper and lower bands before installing. Please snap on the case in correct direction according to the holes. Please use a damp cloth to clean case and watch after a period of using. Full Protection Design: Screen protector built in case cover all the surface and edges from bumps and scratches. 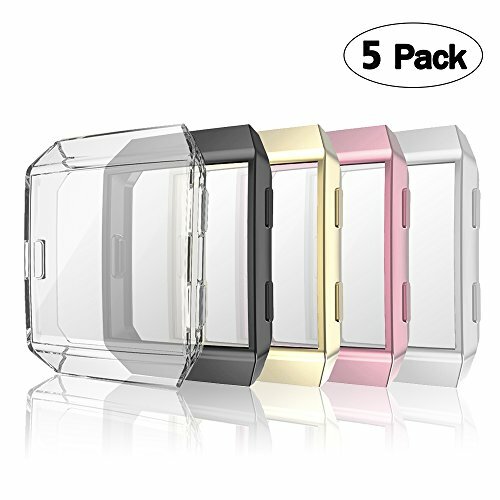 Long Lasting: Made of premium TPU, durable and flexible and ultra-thin case adds no extra bulky to your wrist. Sensitive Sensitivity: Precise button cutouts and high transparency screen cover allow quick response when operating. Multiple Choice: 5 different colors available for you to choose, matching your daily styles by special color. Hassle-free Warranty: 100% refund or refund for any quality-related issues without return after the date of purchase.